Along with hundreds of other “peregrinos” (pilgrims), we attended Mass – Catholics and non-Catholics alike – which ended with a blessing of the peregrinos. Suitably blessed, we moved on to dinner. After dinner we briefly went over tomorrow’s route. 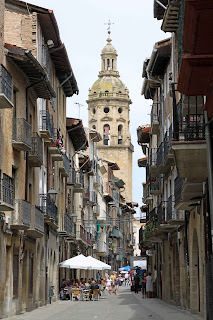 While the walking peregrinos go straight through Pamplona, we will give it wide berth on our way to Puente la Reina. We will do 48 miles with just under 2500 feet of climbing. Upon arrival, I will pick up this narrative. But now, it is bed time. will write this knowing that it will get posted sooner or later. We had a good breakfast at 8:30 followed by our safety briefing and some last minute preparations, so it was about 10:45 by the time we hit the road. Traveling conditions were excellent. It was warm, but not too hot; sufficiently overcast to shield us from the sun, but not to make the day gloomy. A chance of rain was in the forecast, but we never ran into it. The ride trended downhill, although there were two short easy climbs. The roads had little traffic and lots of pleasant scenery. 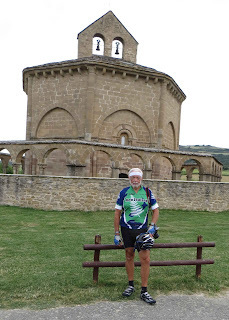 The only real stop en route was at the small church, Santa Maria de Eunate. 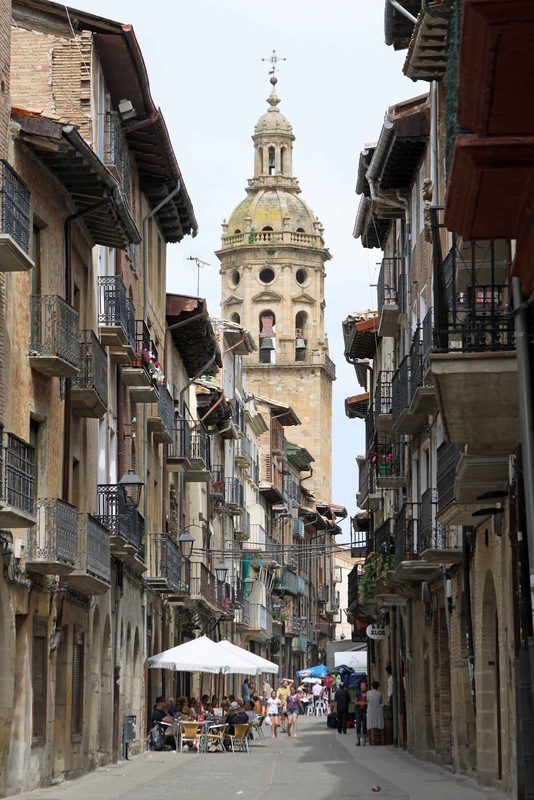 This is one of the most important Romanesque monuments in Navarra. It was closed when I arrived, but the caretaker opened it for a few minutes for me and the four other pilgrims that were there. I had an opportunity to chat with a Dutch woman who was cycling the Camino with her husband. They had started in Holland three weeks ago, and estimate another three weeks to finish. From there it was a short hop to Puente la Reina, our stopping place for the day. I arrived some time after two and was ready for lunch. 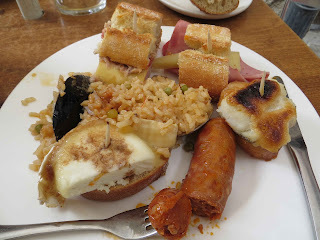 They offered six tapas for 10 Euro – that was more than enough food, and it was absolutely delicious. 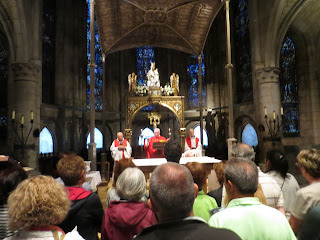 I shared a table with another woman pilgrim from Holland – this one traveling on foot. She also started her home, and has been walking for a few weeks already. We were told this morning that there would be lots of opportunity to meet and talk with people from all over the world. This is certainly proving true. One thing that surprises me however has to do with the local cyclists (not the peregrinos). At home, we commonly wave to a cyclist heading in the opposite direction and get a return wave. Here, I have found that only about one in three or four cyclists returns this greeting. 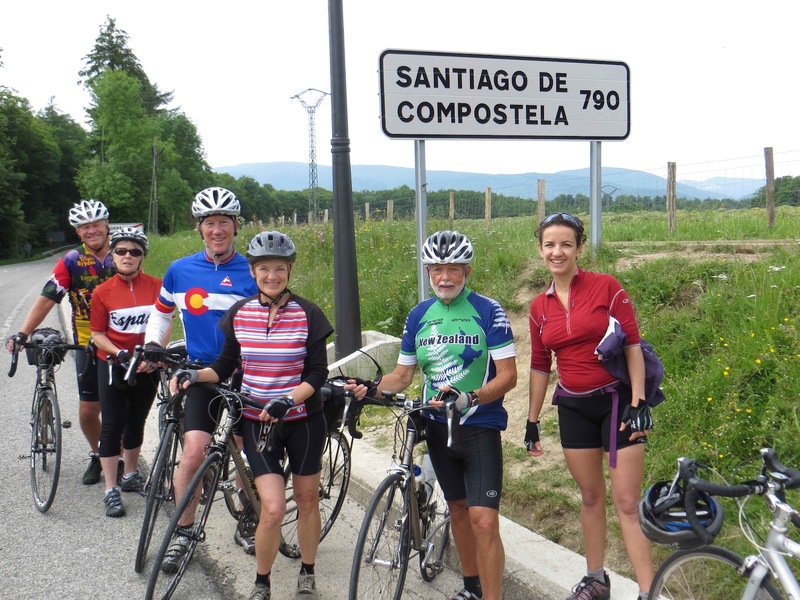 Cycling pilgrims, however, are invariably friendly, even when we only have a few words in common. To properly complete the camino, you are supposed to get at least one passport stamp per day from one of the many places along the way. In addition to the one that I got last night when I picked up the passport, I got three more today – at last night’s hotel, at Santa Maria de Eunate, and at the pilgrimage hostel (“alburgue”) here in Puente Reina. Dinner is at eight tonight, so I have almost three hours to see if I can find an internet connection to get this posted.